Fit and 48 years old, Janet Levy went to a chiropractor to try to relieve a sore shoulder back in 2002. She nearly lost her life. A manipulation of her neck led to a stroke, then brain surgery, paralysis and years of therapy for the Woodbridge woman. But that personal battle seems small compared with the struggle that Levy has undertaken to try to bring a basic reform to chiropractic care in Connecticut. Levy — who leads Victims of Chiropractic Abuse and is behind those ads on the sides of Connecticut Transit buses warning about chiropractors — and a handful of others have for years waged a failing effort to persuade the state legislature to enact legislation to force chiropractors to be a little more frank about what they do. Now, the two sides will dramatically face off again Jan. 5 at 10 a.m. at a hearing at the Legislative Office Building in Hartford before the obscure state Board of Chiropractic Examiners, which has been asked to make a “declaratory ruling” on whether chiropractors should be required to inform their patients about the risks of neck manipulation. The outcome could affect chiropractors, and their patients, throughout the country. No state currently requires that patients be warned of a stroke risk from cervical manipulation. I’ve written about this strange conflict surrounding “informed consent” a few times before, mostly because I can’t understand why chiropractors — who are in the business of relieving pain — are trying to block something that would help their patients make educated decisions. It’s Jesus on a banana peel…or is it a monkey from Planet of the Apes? Lisa thinks she’s found Jesus on her banana peel (insert your own crude sexual joke here). She ate the Jesus banana (insert another crude sexual joke here). I don’t know what to say. To me it looks like a primate. Judge for yourself. 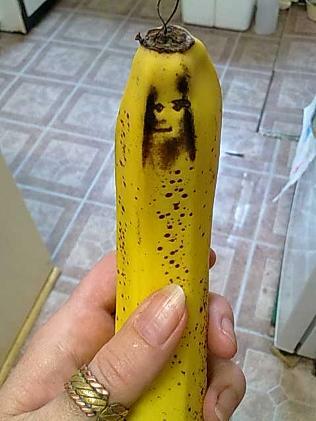 Here is the Jesus banana. 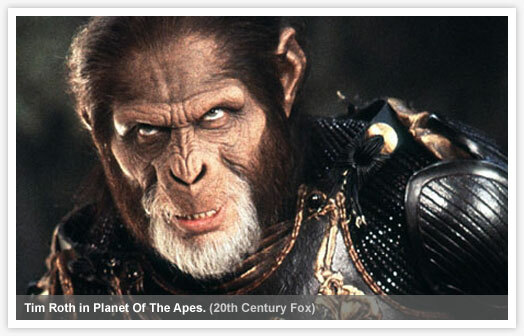 And here are some pics of the apes from the latest Planet of the Apes movie. I see ape! I don’t see jesus at all. What do you see? 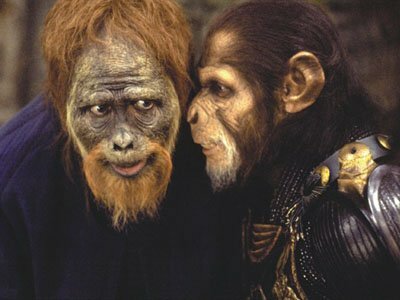 PS: POA fans, please don’t get on my case for referring to the apes as “monkeys” on the title. It really doesn’t matter. Why aren’t America’s psychics helping keep us safe? There are thousands—perhaps tens of thousands—of people who claim to have psychic powers. Some of them can be found in little storefront shops not far from where you may work or live. Some of them can be found on TV, such as convicted felon Sylvia Browne, James van Praagh, John Edward, Alison DuBois, Carla Baron, and others. But all of them have one thing in common: they claim to have specific, accurate information about things outside their immediate knowledge. Some say they can read minds or auras; others say they can predict future events. Which brings us back to the would-be Christmas bomber. The biggest challenge to national security, by definition, is that there is no way to distinguish threats from non-threats, passengers from terrorists, false-positives from positives. Airport security must thoroughly screen every single passenger, from the wheelchair-bound grandmother to the harried businessman to the nose-picking toddler, because everyone must be suspect; anyone could be a potential threat. Psychics, if real, could change all that. If what they say is true—if these people have the powers they claim, why are 99.99% of innocent airline passengers subjected to invasive screening, delays, and hassles, when a psychic should be able to identify the terrorists and direct the security resources toward those people? Well a difference anyway, boils down to the difference between could and is. Skeptics operate, or better we strive to operate, within the limits of IS. Anti-skeptics operate within the limits of could; affirming it as an IS and disregarding if it CAN! The Centers for Disease Control (CDC) has published the results of their latest study on the prevalence of autism. There is no question that in the last 20 years the number of autism spectrum disorder (ASD) diagnoses has increased. What is also clear is that during this time there has been increased surveillance and a broadening of the diagnosis of ASD. Whether or not this accounts for the entire increase in ASD numbers, or if there is a true increase in there as well, is unknown. In 2006, on average, approximately 1% or one child in every 110 in the 11 ADDM sites was classified as having an ASD (approximate range: 1:80–1:240 children [males: 1:70; females: 1:315]). The average prevalence of ASDs identified among children aged 8 years increased 57% in 10 sites from the 2002 to the 2006 ADDM surveillance year. Although improved ascertainment accounts for some of the prevalence increases documented in the ADDM sites, a true increase in the risk for children to develop ASD symptoms cannot be ruled out. On average, although delays in identification persisted, ASDs were being diagnosed by community professionals at earlier ages in 2006 than in 2002. That 1 in every 110 children on average now carry an ASD diagnosis is not new news. This CDC data was actually released ahead of publication in October. At the same time a phone survey published in Pediatrics found 110 in 10,000 children carried an ASD diagnosis – or a little more than 1%. This 1% figure seems to be highly replicated – a National Health Services survey released in September also found a prevalence of 1% for ASD in the UK.